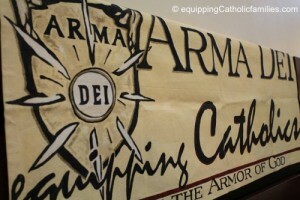 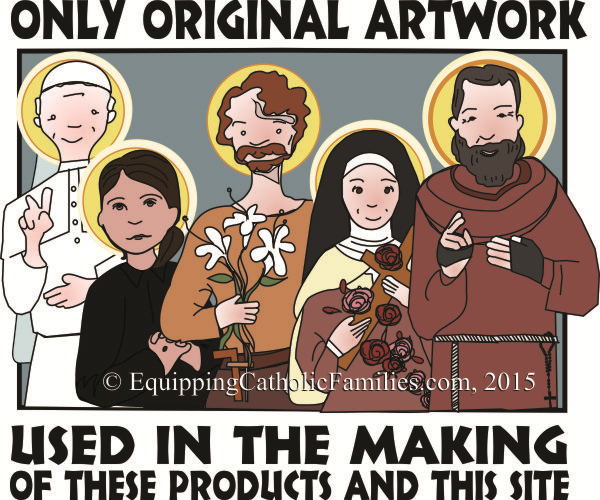 461 Saint Stickies: Original Catholic Artwork! 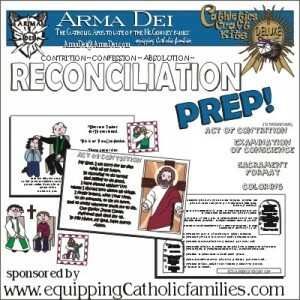 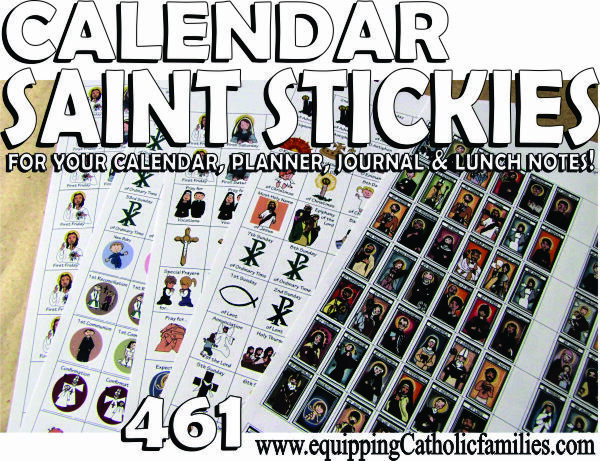 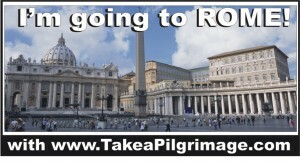 461 Saint Stickies: Original Catholic Artwork for your Calendar, Planner or Journal! 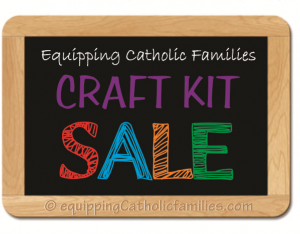 Last week, I released our new craft kit, the Adjustable Liturgical Calendar. 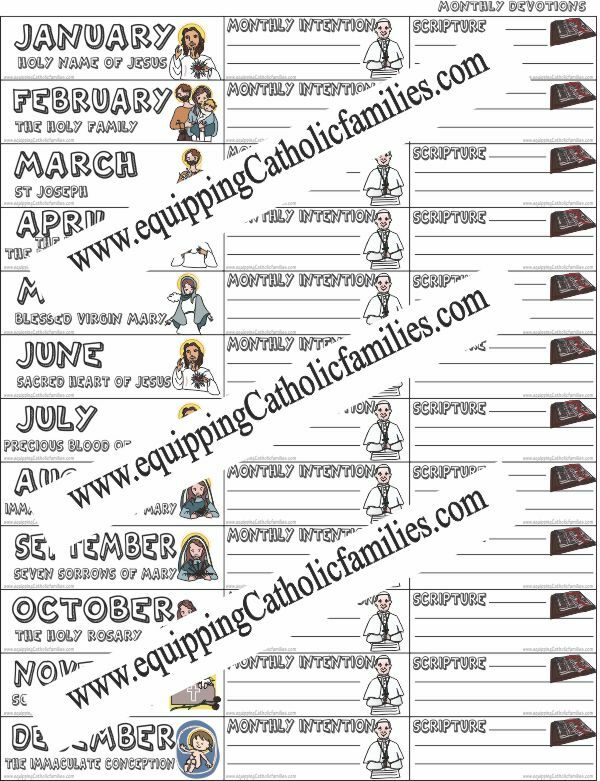 It can be used year after year, and it comes with these awesome original-artwork Saint Stickies to customize the Liturgical Calendar. 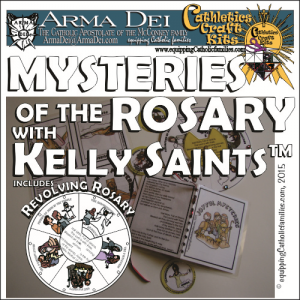 …with extra Catholic stickers for lunch notes and snail mail. 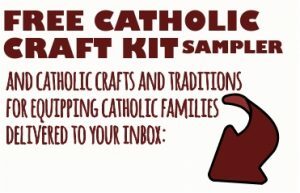 Just like tapping into the Liturgical Calendar for my book A Treasure Chest of Traditions for Catholic Families…where do you stop?!? 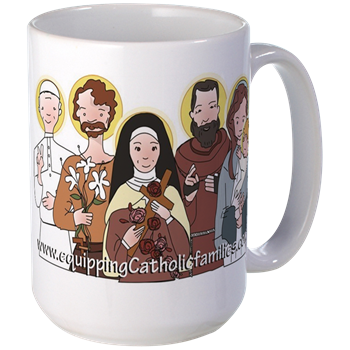 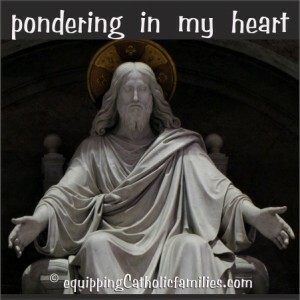 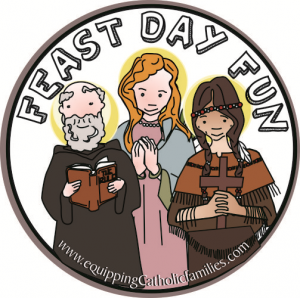 There are SO many awesome reasons to celebrate with the Feast Days and Seasons of the Liturgical Calendar…and then there are monthly devotions, Sacraments and good Catholic practices we can always use cute reminders for. 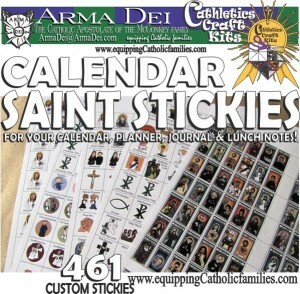 So there you have it…the Saint Stickies Craft Kit with 461 Stickies, instructions for printing (and making stickers)…and ideas for how to use these at home. 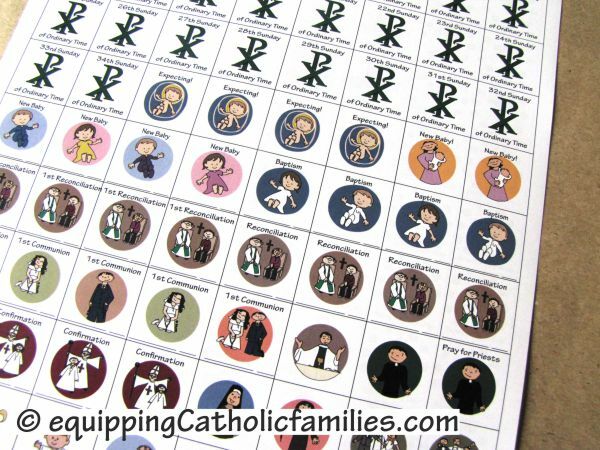 The reminders are colorful and cute and have already helped us jump into the Liturgical Calendar…right there at our fridge calendar. 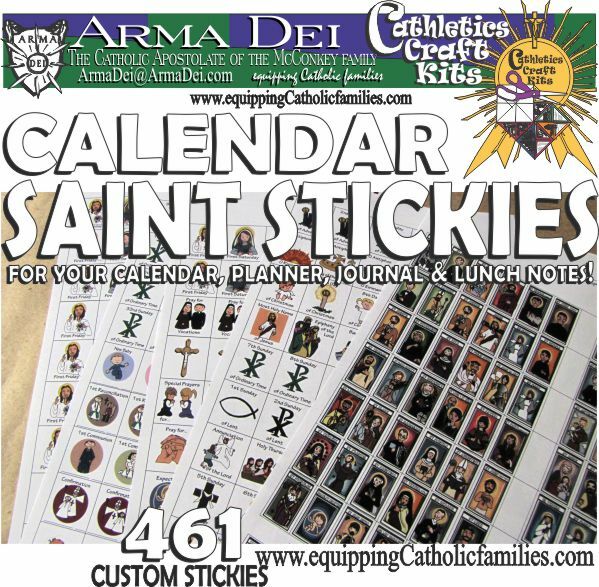 The Saint Stickies are a little smaller (than the templates of the Adjustable Liturgical Calendar) to accommodate most wall or fridge calendars. An index of Saint Feast Days is included within the kit for easy reference. 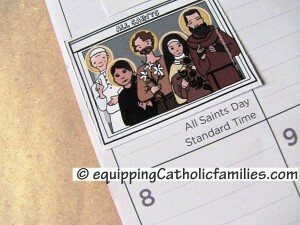 Once you start working with the templates, you’ll notice that these saints are generally grouped by the month their feast days occur in. 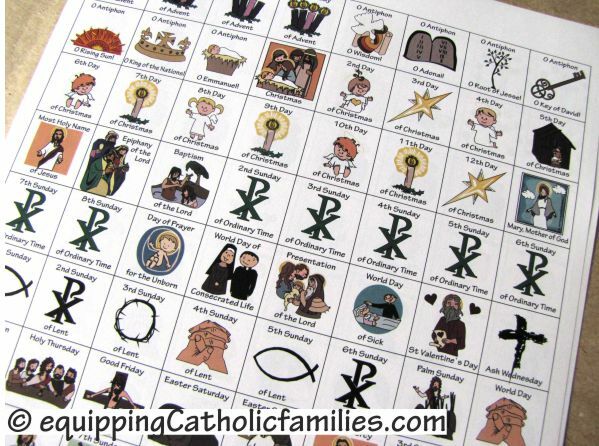 We’re ready to start the new Liturgical Year of Mercy with Advent Stickies marking the different weeks, O Antiphon Stickies plus key Feast Days and Season markers. 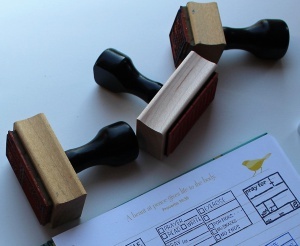 …and logs and lists to add easily to calendars, planners and journals! 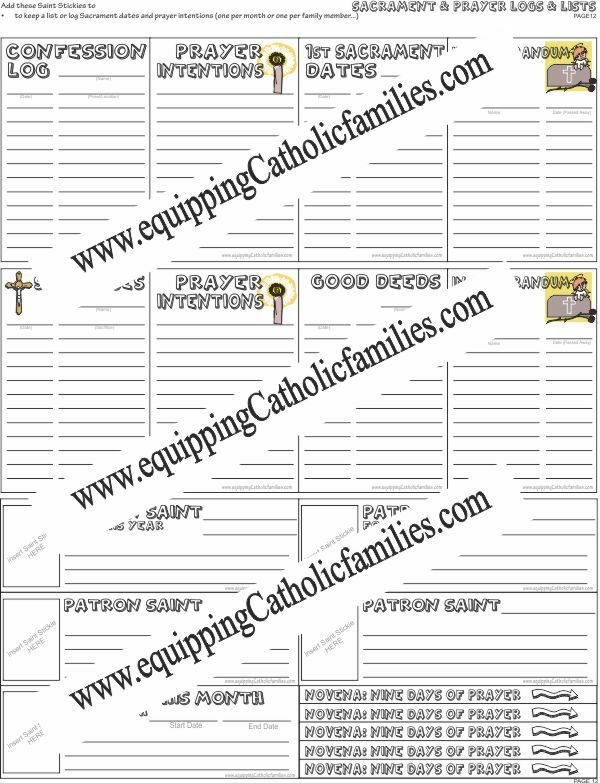 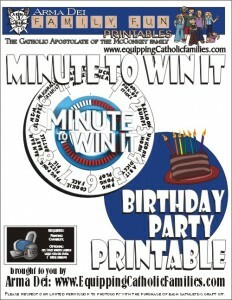 With the included permission to copy for home or classroom use, you’ll be able to convert your calendars, planners and journals to Catholic, year after year! 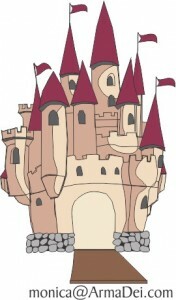 Once again…this ain’t no ordinary clipart! 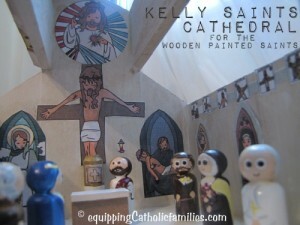 Our Catholic artwork features our unique Kelly Saints (drawn by our now-17-year-old daughter Kelly) and other original artwork created digitally by Monica. 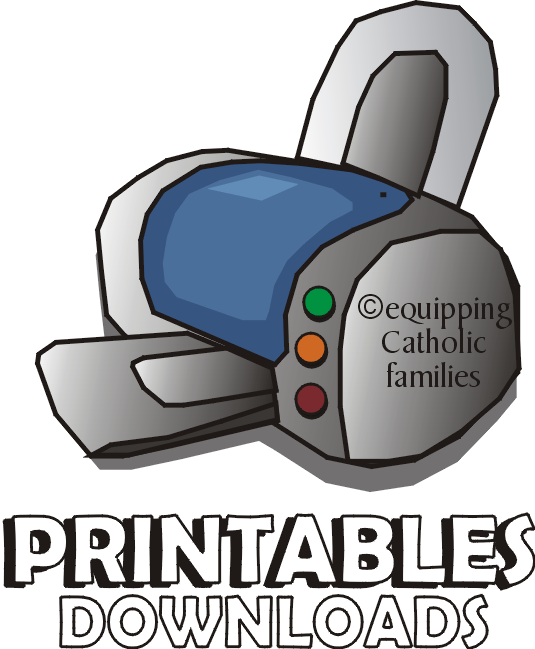 Instructions are included to print on label paper or create your own easy-to-use stickers by cheaper means! 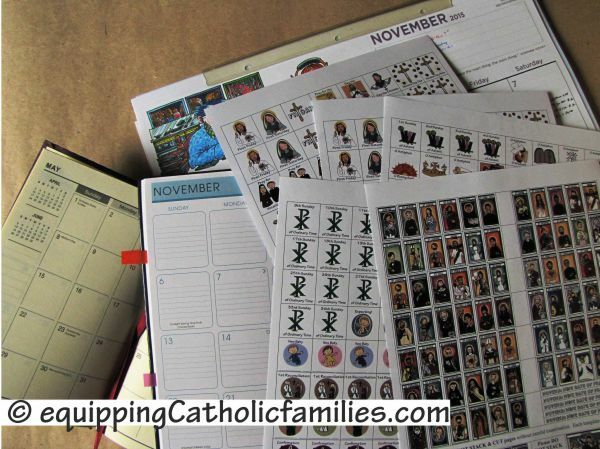 Your family calendars, planners, journals and diaries…will never be the same! 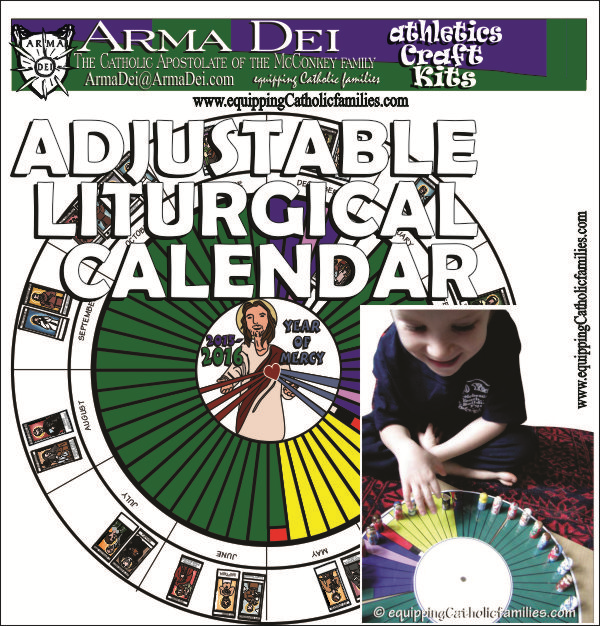 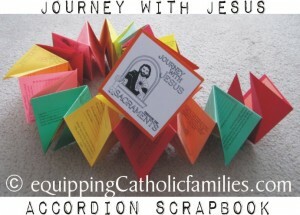 NEW Craft Kit: Adjustable Liturgical Calendar! 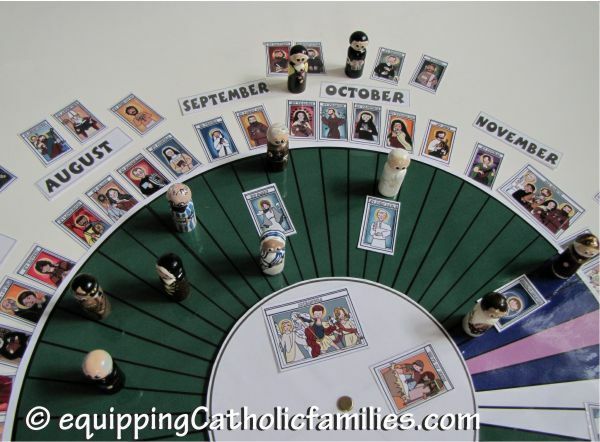 LOVE the Adjustable Liturgical Calendar idea. 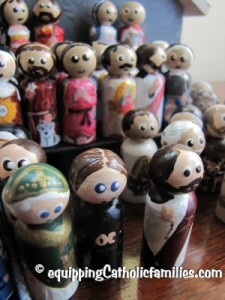 Thank you for sharing all of your creative work! 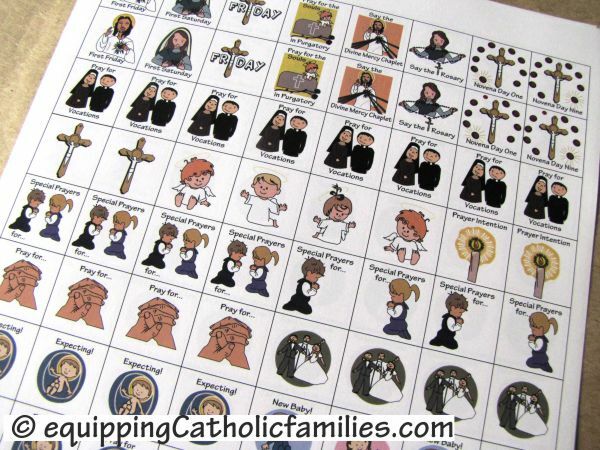 What are the dimensions of each sticker? 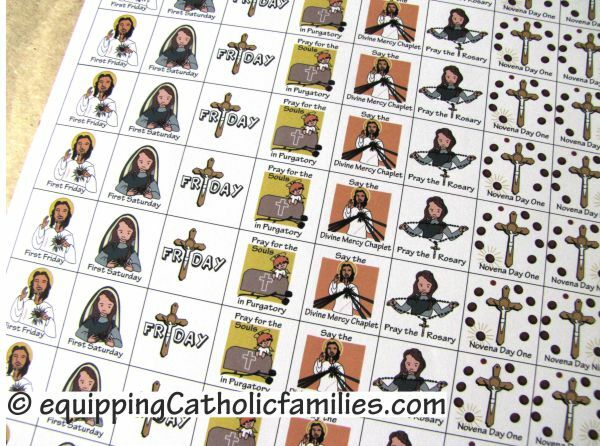 Most of the stickers are 1″ square. 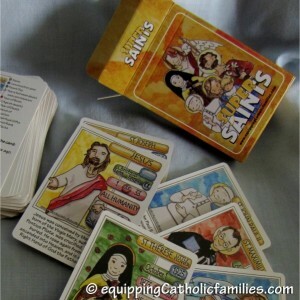 The Saint stickers are 1″ tall by 1/2″ wide and the monthly devotion stickers and intentions and scripture stickers are almost 3″ wide and 3/4″ tall. 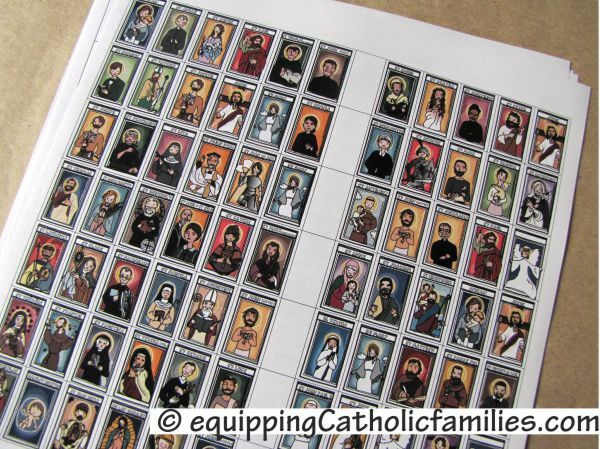 The list stickers (confession log, prayer intentions, sacrifices and dates) are 3″ tall by 2″ wide and the Patron Saint of the Year, Novena stickers are 4″ wide by 1″ tall. What type of stickers/labels do you suggest using?